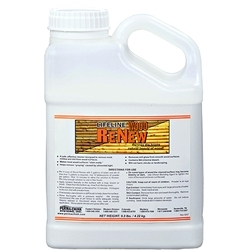 Wood ReNew contains a thickener that helps it adhere to log walls and siding. Mix the Wood ReNew concentrate with warm water, stir for about 5 minutes with a paint mixer and electric drill until no undissolved granules are visible, let Wood Renew sit in container for 10 minutes to thicken and liberally apply it to the wood with a mop or brush. Wood ReNew will immediately begin to fizz and foam as it removes dirt and grime. After about 10 minutes scrub the wood with a medium-bristle brush and rinse with a power washer. Dirt, pollen, grime, other surface stains and UV damage will be gone and the wood will have a new, fresh look. Wood ReNew should not be used for spot cleaning since it may cause blotching of the surface. We bought and used both Wood Renew and Cedar Wash to clean and freshen our roughcut fir, contemporary home. The products really did the job and the instructions, videos and chat support made it easy for us to really spiffy up the place. Just look at the difference! Thanks Permachink! My cabin was black and grey from years of weathering. Put on wood renew was blown away the next morning. The wood looked like the the cabin was built. Absolutely amazing product!! Just bought a 25yr old log home that has never had any exterior finish on it but 25yrs of dirt and weather. I tried a press use washer with just straight water and it did nothing to remove the very dark buildup. Used the wood renew and a nylon brush and rinsed with a garden hose, eveything came right off with ease. It was amazing and I wish I could add a before and after picture. I used cleaner after cleaner on my 20 year old completely black log home and the only thing that worked was Wood Renew. It was like night to day, I couldn’t even believe it. We recently moved into an older log home that had not been stained before and the wood was all silver from sun damage so we were told to try your Wood Renew product by a friend. This product was amazing! The logs went from grey to beautiful brand new looking wood which we were then able to stain with your Ultra 7. Good product once we figured out how to mix it! At first, we tested Wood Renew by mixing 12 Tablespoons per 1 Gallon of water using cold water, but it did not mix or thicken well. We checked with the Knoxville Perma-Chink Store and they suggested using warm water. Finally, it mixed well and we let it thicken up. Application was easy -- we used a mop and sponge to apply it to the logs and a pressure washer to wash it off. Our wood looks clean and brighter now. Thanks Perma-Chink! Wood Renew was recommended through an on-line chat with Perma-Chink as a cleaner for our new to us older log cabin. It had not had any maintenance performed on it in years and had grayed considerably. The Wood Renew along with a pressure washer took away all the dirt, mold, and grayed wood and brought our cabin back to a like new appearance. From that point it was stain, topcoat, and enjoy!! This was great product for my log cabin! Our logs needed to be cleaned and we had lots of gray UV wood damage. We used Wood Renew as our cleaner and our log cabin has not looked this good in a long time! Thank You! My log home looks like new after using Wood Renew! It took all the UV damaged wood off the old log siding as well as some mill glaze on the new siding. Another great log cleaner from Perma-Chink Systems!